Scooper - Story News: Can you work out the two correct answers to this puzzle? Can you work out the two correct answers to this puzzle? How good do you think you are at maths? Did you leave your adding up skills behind you at school or do you love a good puzzle? One riddle circulating on the internet is causing debate - because it has two possible answers and so splits people into two separate groups. Have a go at working out the equations below and tell us which answer you worked out. If you work out both answers, you're among the elite - apparently only 1 in 1000 people can do it. The puzzle, made by gotumble.com and posted on Wikr, asks anyone up for the challenge to work out two different correct answers to several maths questions. The makers write: "Firstly, think outside the box! 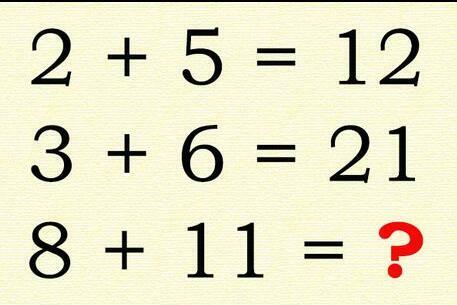 This maths riddle is not that simple. Even though there’s usually one right answer for maths problems, two common solutions are causing heated debates all over the world." "To begin with, most people will agree that 1 + 4 = 5. "Then you’ll move onto the next line, where you’ll add 2 + 5 to the sum of 5 in the equation above. That gives you the answer of 12. "On the following line, you’ll apply the same type of process. 3 + 6 = 9, then add the 9 to the sum in the equation above (12) to get the total of 21. "Finally, take the 8 + 11 in the last equation, which equals 19, and add it to the sum of the previous problem (21). That should give you a grand total, of 40! "40 is a widely accepted correct answer, but… there can be another right answer. See the second solution below." If your brain is wired in a slightly different way, you might work out the equations differently - by also multiplying the second number by the first when you're adding up. Yes, 1 + 4 = 5, but so does 1 + (1x4). On the second line, 2 + (2 x 5) = 12 and, on the third, 3 + (3 x 6) = 21. So when it comes to the fourth equation, some people will add 8 to (8 x 11) and get an answer of 96.